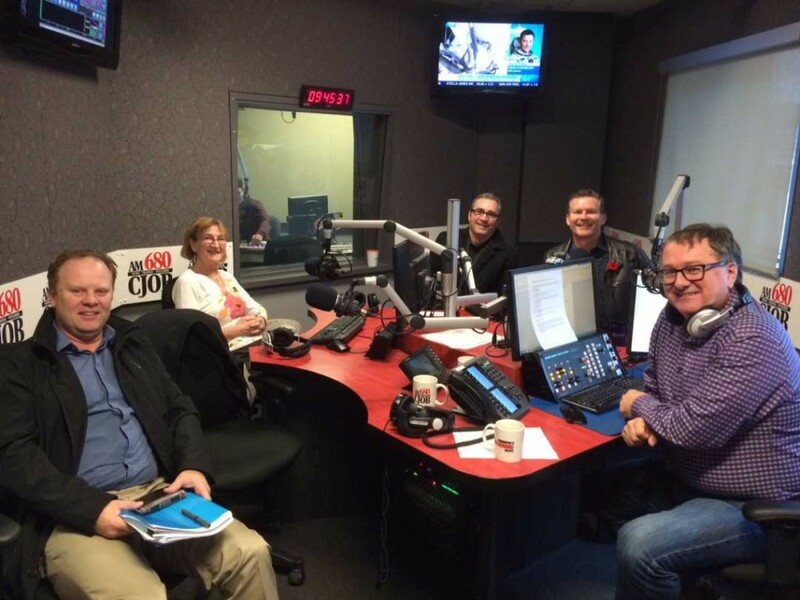 There has been some informative media coverage regarding the proposed South Winnipeg Recreation Campus. I encourage you to review the latest news on this important initiative! A regional recreational campus incorporating schools, recreational and leisure facilities and a library is being proposed for southwest Winnipeg. Area councillor Janice Lukes said if the project becomes a reality, it would be a first of its kind in Winnipeg. The civic administration is proposing $350,000 be set aside to kick-start a search for a site, a search private/public sector partners, conduct community consultations and to develop detailed facility designs. Lukes said the report, which will be presented to the property and development, heritage and downtown development committee Tuesday, is misnamed as a proposal for Waverley West — it would serve recreational needs for all of southwest Winnipeg, the neighbourhoods south of Bishop Grandin Boulevard and west of the Red River: Waverley Heights, Bridgwater Forest, Bridgwater Lakes, South Pointe, Richmond West, Fort Richmond, University Heights. Lukes support for the project will carry a lot of influence inside city hall. In addition to being the ward councillor, Lukes chairs the public works committee and sits on the mayor’s executive policy committee, which dictates the agenda for a lot of what happens at city hall. The southwest corner of the city has been under-serviced with recreational facilities for years, Luke said. The city’s policy is to have 1.8 square feet of recreational/leisure/library space per capita but she said a 2005 study revealed that area of the city had 1.6 square feet per capita. With the opening up of Waverley West, the per capita space is expected to fall to 0.9 square feet. The report is based on the recommendations of a consultant’s study, the BRAID report, which identified the future site of two schools in the area as the ideal location for a regional campus. Lukes said the southwest quadrant should be entitled to 3.5 community centres but the BRAID report found broad support for a regional recreational campus in a single location. The BRAID report, which was based on consultations with 15 community groups over a year-long period, said there appeared to be a consensus to repurpose existing recreational facilities in the area in order to secure a regional recreational campus with updated facilities. The BRAID report said the Pembina Trails school division recently purchased a 25-acre site in Waverley West and the division is open to sharing some its space for recreational and community needs in a campus model. The BRAID report also said the city has an agreement with the YM-YWCA, where a new super Y in Waverley West could provide facilities that city hall provided in the past. The consultants said it’s hoped that the provincial government, which was the developer of Waverley West, would also get involved and suggested it could provide the remaining land needed for the recreational facilities. It also identified the potential for financing from the sale of naming rights to many of the facilities. Lukes said it would be four to five years before such a project comes to fruition. Agreements have to be worked out with the YM-YWCA on what facilities it would be prepared to contribute and arrangements to incorporate the facilities into regular classroom scheduling and public use. Detailed community consultations will have to be carried out followed up with conceptual and detailed designs; pricing and support from the provincial and federal governments. Lukes said that the regional campus model addresses concerns that school facilities are closed on evenings and weekends. This model, she said, incorporates the facilities into classroom scheduling and community use. “It’s an ideal example of shared use,” Lukes said. The BRAID report states there been opposition inside city hall to the concept. Lukes said she believes there are some quarters who see the regional campus model as an attempt to contract out traditional city services and their jobs to the private sector. “This isn’t the traditional model for community centres and some folks may have a hard time embracing it,” Lukes said. “The city has to look at creative partnership opportunities. While BRAID didn’t speculate on the fate of the existing facilities, it identified some of the likely targets: Margaret Grant park and pool; the Ryerson ice complex; the St. Norbert community centre; the Richmond Kings community centre; the Pembina Trail library; and the Waverley Heights community centre. Lukes said none of those facilities would be closed but could be turned over to area schools and neighbourhood groups for operation. Planning, Property & Development staff prepared conceptual site plans for a community recreation campus at 10, 20 and 40 acres. These plans do not represent specific design proposals and are only intended to show how specific uses are aggregated to an overall land requirement. 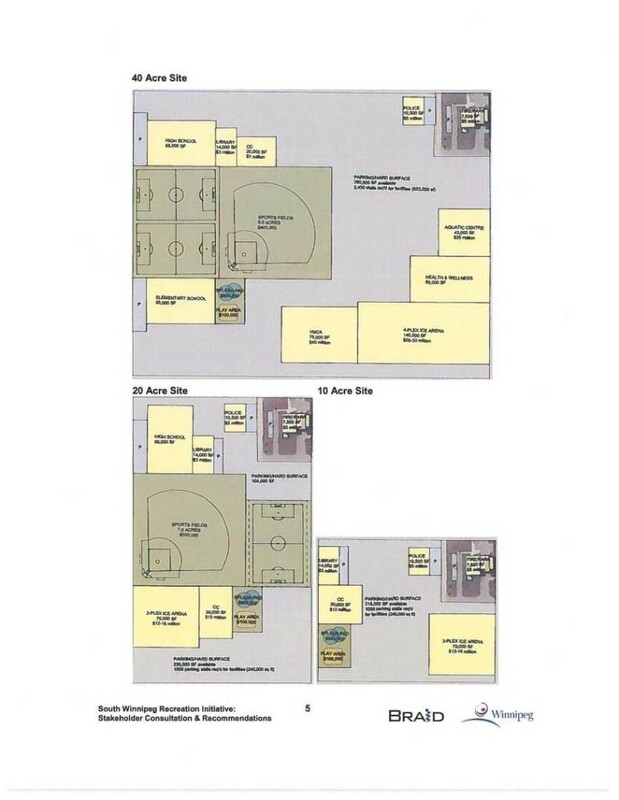 These conceptual plans also indicate representative costs for some of the facilities.